(1) AFTER THESE THINGS JESUS WENT OVER THE SEA OF GALILEE, WHICH IS THE SEA OF TIBERIAS. (2) AND A GREAT MULTITUDE FOLLOWED HIM, BECAUSE THEY SAW HIS MIRACLES WHICH HE DID ON THEM THAT WERE DISEASED. (3) AND JESUS WENT UP INTO A MOUNTAIN, AND THERE HE SAT WITH HIS DISCIPLES. (4) AND THE PASSOVER, A FEAST OF THE JEWS, WAS NIGH. (5) WHEN JESUS THEN LIFTED UP HIS EYES, AND SAW A GREAT COMPANY COME UNTO HIM, HE SAITH UNTO PHILIP, WHENCE SHALL WE BUY BREAD, THAT THESE MAY EAT? (6) AND THIS HE SAID TO PROVE HIM: FOR HE HIMSELF KNEW WHAT HE WOULD DO. (7) PHILIP ANSWERED HIM, TWO HUNDRED PENNYWORTH OF BREAD IS NOT SUFFICIENT FOR THEM, THAT EVERY ONE OF THEM MAY TAKE A LITTLE. (9) THERE IS A LAD HERE, WHICH HATH FIVE BARLEY LOAVES, AND TWO SMALL FISHES: BUT WHAT ARE THEY AMONG SO MANY? (10) AND JESUS SAID, MAKE THE MEN SIT DOWN. NOW THERE WAS MUCH GRASS IN THE PLACE. SO THE MEN SAT DOWN, IN NUMBER ABOUT FIVE THOUSAND. 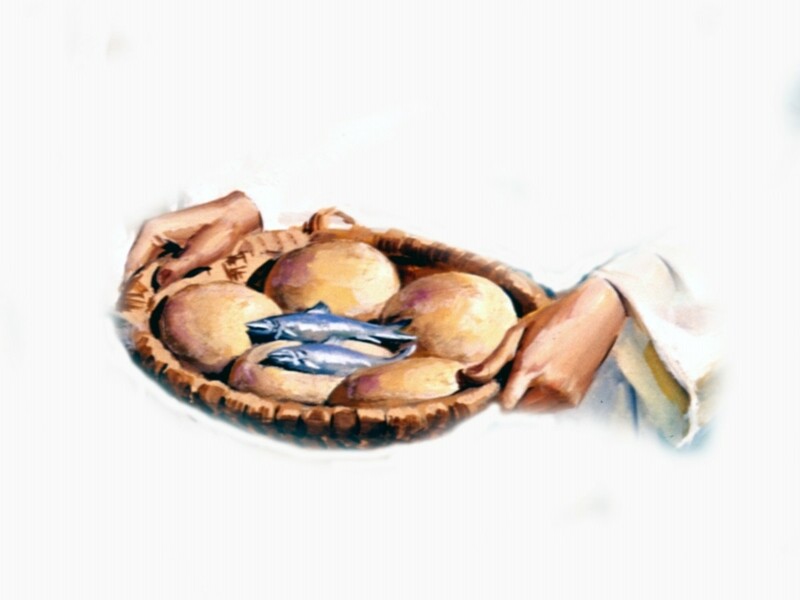 (11) AND JESUS TOOK THE LOAVES; AND WHEN HE HAD GIVEN THANKS, HE DISTRIBUTED TO THE DISCIPLES, AND THE DISCIPLES TO THEM THAT WERE SET DOWN; AND LIKEWISE OF THE FISHES AS MUCH AS THEY WOULD. (13) THEREFORE THEY GATHERED THEM TOGETHER, AND FILLED TWELVE BASKETS WITH THE FRAGMENTS OF THE FIVE BARLEY LOAVES, WHICH REMAINED OVER AND ABOVE UNTO THEM THAT HAD EATEN. (14( THEN THOSE MEN, WHEN THEY HAD SEEN THE MIRACLE THAT JESUS DID, SAID, THIS IS OF A TRUTH THAT PROPHET THAT SHOULD COME INTO THE WORLD. SOME PEOPLE DON’T UNDERSTAND OR REALIZE THAT MY ALMIGHTY GOD EL SHADDAI PERFORMS MIRACLES EVERY DAY. HALLELUJAH!! THANK YOU JESUS. GLORY TO GOD. PRAISE THE LORD BECAUSE HE IS WORTHY!! I PRAY THAT I HAVE SAID SOMETHING TO ENCOURAGE SOMEONE THIS MORNING. GOD LOVES YOU AND SO I. HAVE A PEACEFUL DAY. GOD BLESS YOU!! Categories "JESUS CAN WORK WITH IT", OUR DAILY MEDITATION SCRIPTURES.